Only2perCent » December 11th, 2017, 9:33 am wrote: Weightlessness occurs only, when distance to the center of gravity diminishes with exact acceleration of free fall. Period. Just adding "Period" to the end of a sentence doesn't make it so. Only2perCent » December 11th, 2017, 9:33 am wrote: Back to empirical reasoning, for a heavier father the shoulder harness will have to work harder, than for a little child. Meaning, the centrifugal forces are not equal for objects of different mass. Nor are the gravitational forces. Mass is absolutely irrelevant here, as it is can be removed from the forces on both sides of the equation. I know this can be tricky to figure out. The centrifugal force, in vector terms, is just the difference between the straight line (the route the object wants to travel due to it's current velocity) and the curved line (the one it is forced to travel). Only2perCent » December 11th, 2017, 9:33 am wrote: Oh, by the way, the Moon also orbits the Earth and the "canceling out" should take place there, as well. Where is the "weightlessness" here? Conclusion - weightlessness has nothing to do with the "cancellation", only with "falling" (in relative terms). The moon, in this prevalent model, is an object with enough mass to create its own gravitational field (as opposed to any artificial spacecraft). But yes, due to orbiting, neither earth's gravity nor its centrifugal force play any significant role. Trust me, the theoretical model of all this has thoroughly been checked and I doubt it will be possible to find any significant flaw with it. The only flaw is....at least as far I believe...it does probably not match reality. The incident was also taken as a military threat. The Chinese regime’s space program is run by its military. The regime’s willingness to cause this kind of destruction in space without warning was seen as a threat to satellites belonging to countries around the globe, The Washington Post reported. A 19,000-pound space station that the Chinese regime admits to having lost control of in 2016 will crash land somewhere on Earth this March, experts predicted. A 19,000-pound space station story that the Chinese regime admits to having thematically written to have lost control of in 2016 will is being directed to crash land somewhere on Earth this March, experts global military intelligence propaganda sphincters predicted directed for purposes of psychological manipulation of the world population in conjunction with many other congruent operations, that help the population swallow the idea that erratic and chaotic events necessitate their own parasitic positions. I find it somewhat incredulous [that is if the "google translate" is correct] that a Chinese/Communist Government would allegedly send a Satelite/spaceship into "space" whose name translates into "Temple", what, with its theistic connotations. I think you mean you find yourself incredulous, pov603! I know what you mean, though. You raise a very good point. It will be "interesting" to see where and when it "lands", North Korea? Iran? How they made these tricks on the ISS? do you know how they could realise this kind of tricks with water? Re: How they made these tricks on the ISS? That was in 1989, so it shouldn't be that difficult nowadays. milesker wrote: How they made these tricks on the ISS? Milesker, I suggest you post this kind of stuff in the Fakery in Orbit thread instead of littering the forum with half-baked topics. Ok, but I did knew where let this question. Perhaps you know I have already made lot of video to explain the Iss fakery, but in french. And people ask me about this water bubble in this video. Ok ok, it's look like right. China’s prototype space station, whose name translates as “Heavenly Palace 1,” met a fiery end in Earth’s atmosphere today (April 1), breaking apart and burning up in the skies over the southern Pacific Ocean at about 8:16 p.m. EDT (0016 April 2 GMT), according to the U.S. Strategic Command’s Joint Force Space Component Command (JFSCC). “The JFSCC used the Space Surveillance Network sensors and their orbital analysis system to confirm Tiangong-1’s re-entry,” U.S. Air Force officials wrote in a statement. In 2016, China's Manned Spaceflight Engineering group lost control of Tiangong-1, sealing the spacecraft's fate. Left uncontrolled, the space station module will fall to Earth and burn up in the atmosphere as in this illustration. 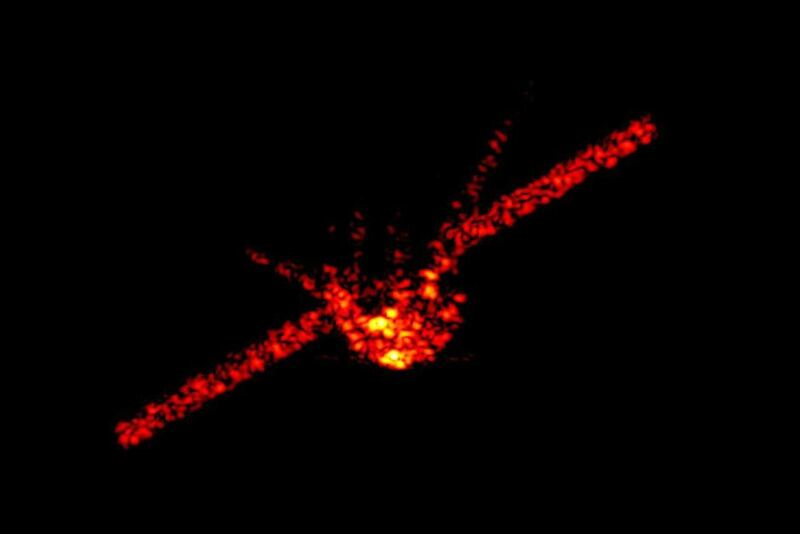 This radar image shows the shape of China's space station Tiangong-1 as it began its fall. However there does appear to be video evidence because Thierry Legault managed to capture these shots on 2018. ápr. 1. Hmm, I'm not sure that's a super convincing evidence of the story. We can definitely see some stuff and twinkly lights up there but there's so much evidence that there is a deliberate PR deception about satellites and space stations that we are not sure what the true connection is yet between the stories of these objects and the actual technological mechanisms. It probably doesn't involve rocketry being above the atmosphere for longer than a very short flight of "a minute or three". Everything else with guaranteed sustainability involves lighter-than-air craft. I have had a problem with the photography aboard the ISS for a while. I do feel a bit late to the party, given Simon pretty much destroyed the notion of the ISS on the first 3 pages of the thread. Anyway, here I am on page 102! This is my opener on photography aboard the ISS. The first image depicts 6 Nikon camera bodies and 6 lenses uncovered floating randomly amongst one another without a human in sight to prevent their smashing into one another and damaging a) the camera bodies b) the lenses c) the ability to photograph stuff in future due to damage. I know of no photographer who does not treat their professional Nikon camera and lenses with the greatest care and respect imaginable. This is totally out of kilter, out of sync, out of whack with reality. Photo number 2 shows 3 Nikon bodies and 3 attached telephoto lenses. The fragile 800mm lens alone costs almost $15,000! Are you honestly going to jeopardise three cameras and lenses for a cheap parlour trick? This is insulting to the notion that these are serious scientists and engineers and adults. Photo 3 is a repetition of the chaos that I doubt could ever be allowed to happen. I find it hard to reconcile how these photos can ever have been taken or allowed to have been taken. It goes against every grain of common sense. Why not just use some biscuits like you normally do for the cheap parlour trick? Moving on…...given space is such an unknown. I was fascinated to hear a photography talk aboard the ISS. Here is a brief chat from astronaut Geoff Williams. The transcript is below for anybody interested to read his bizarre borderline mental debenture, factually incorrect, rushed photo chat. Hello Geoff here, been a while since I gave you an update, thought I'd just check in I'm glad you're enjoying the photography many of you have given me feedback, i've heard about the feedback, er that you've given the folks on the ground as well, so I appreciate that, it's a real thrill for me to bring the experience to you through photography, some of you have asked how we take pictures up here. We actually use just regular photography equipment, er, this NIKON D4X is one of several cameras that we have onboard so the photography that you see is hand held photography. No you don't! The D4 is NIKONS top professional camera! Moreover, it's not a "D4x" (as you said). The D4x does not exist! "Hand held photography"? What on earth? some of the videoclips are actually er, videoclips made of er, panoramas of still photography stitched together er merged together…its overlapping shots that I've made and stitched together and then the folks on the ground have helped em em make a video clip out of them! Erm we have a variety of lenses like the one I just showed you. We have wide angle lenses, we also have very big lenses, we've got several of these as well, and it's through this lens, this is an 800mm lens, with a 1.5, er a 1.4 multiplier on so that brings in the detail pretty close. There ends the photography chat at 1.17 out of 3.33. Geoff goes onto to chat about windows and the cupola after omitting virtually every detail or personal experience imaginable.